Island in the Ægean Sea. According to a study, as yet unpublished, by Leonidas Zoë, a lawyer of Zante, Jews did not settle there as a community until 1498, and this statement is confirmed by the silence of Benjamin of Tudela. In that year, however, the republic of Venice offered special privileges to those who wished to reside in the island, which had become depopulated as a result of the frequent Turkish invasions; and many Jews of Corfu, Patras, Lepanto, and other parts of Greece welcomed the opportunity. The Jewish families mentioned in the earliest published documents are those of Abdela (1499) and Mila (1510). In 1527 the Jewish population of the island was 240, but by 1555 it had dwindled to 140, although it had risen to 300 in 1809. 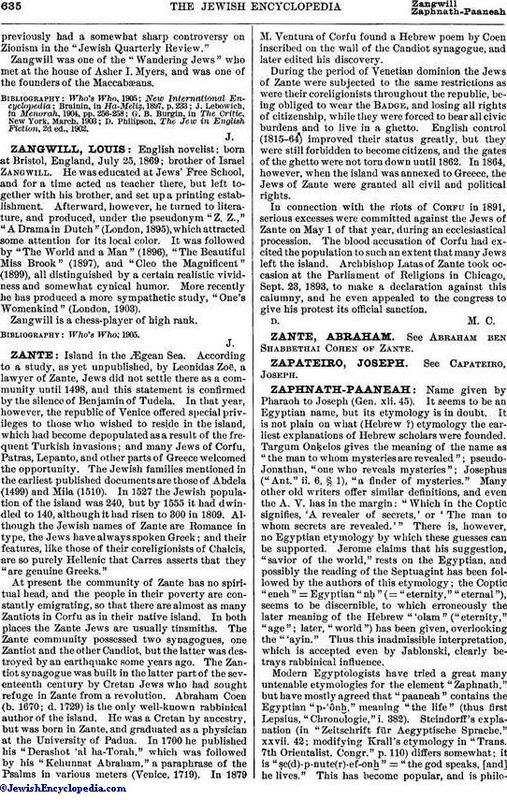 Although the Jewish names of Zante are Romance in type, the Jews have always spoken Greek; and their features, like those of their coreligionists of Chalcis, are so purely Hellenic that Carres asserts that they "are genuine Greeks." At present the community of Zante has no spiritual head, and the people in their poverty are constantly emigrating, so that there are almost as many Zantiots in Corfu as in their native island. In both places the Zante Jews are usually tinsmiths. The Zante community possessed two synagogues, one Zantiot and the other Candiot, but the latter was destroyed by an earthquake some years ago. The Zantiot synagogue was built in the latter part of the seventeenth century by Cretan Jews who had sought refuge in Zante from a revolution. Abraham Coen (b. 1670; d. 1729) is the only well-known rabbinical author of the island. He was a Cretan by ancestry, but was born in Zante, and graduated as a physician at the University of Padua. In 1700 he published his "Derashot 'al ha-Torah," which was followed by his "Kehunnat Abraham," a paraphrase of the Psalms in various meters (Venice, 1719). In 1879 M. Ventura of Corfu found a Hebrew poem by Coen inscribed on the wall of the Candiot synagogue, and later edited his discovery. During the period of Venetian dominion the Jews of Zante were subjected to the same restrictions as were their coreligionists throughout the republic, being obliged to wear the Badge, and losing all rights of citizenship, while they were forced to bear all civic burdens and to live in a ghetto. English control (1815-64) improved their status greatly, but they were still forbidden to become citizens, and the gates of the ghetto were not torn down until 1862. In 1864, however, when the island was annexed to Greece, the Jews of Zante were granted all civil and political rights. In connection with the riots of Corfu in 1891, serious excesses were committed against the Jews of Zante on May 1 of that year, during an ecclesiastical procession. The blood accusation of Corfu had excited the population to such an extent that many Jews left the island. Archbishop Latas of Zante took occasion at the Parliament of Religions in Chicago, Sept. 23, 1893, to make a declaration against this calumny, and he even appealed to the congress to give his protest its official sanction.